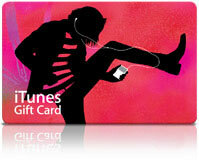 iTunes Gift Cards, also known as iTunes Gift Certificates and as of 2013 iTunes Gifts allow you to give your friends or family a credit at the iTunes Music Store OR gift them ANY item on the iTunes music store. If you’ve already got iTunes installed AND have an Apple ID then simply — click on this link — and you’ll be whisked away to the buy iTunes Gift section of the iTunes music store. If you gift them a credit the recipient can then be use this credit (anywhere between $10 and $100) to buy Individual songs, Albums (Beatles), Playlists (a number of songs but not in an Album), Audiobooks, Books, Music Videos, Movies, TV shows (TopGear!) and even iPhone and iPad programs / apps (Angry Birds is great). Physical Itunes Gift Card – this is a physical card that is mailed out snail mail (regular mail, delivered using a mail carrier) . The gift card is placed inside a nice paper card. You can write a message / birthday greeting inside the paper card using your computer. They come in denominations of $15, $25, $50 and $100 . 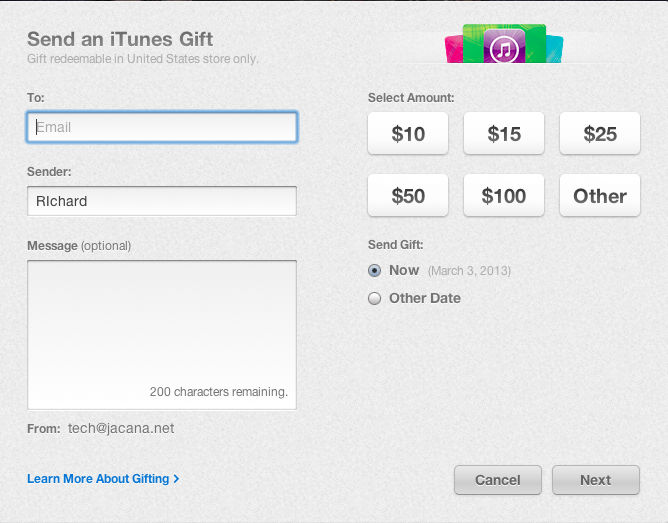 Itunes Gift Certificates / Cards make great birthday gifts. iTunes Gift Cards are physical Cards that will be mailed to the recipient once purchased (they come in $15, $25 and $50 denominations). 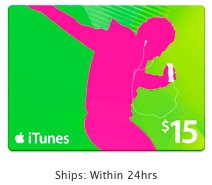 Itunes Gift Certificates are like virtual gift cards and are sent to the recipient instantly via email and and come in $10, $20, $30, $40 and $50 denominations. Gift Certificates make great last minute gifts as they can be bought in a matter of minutes from the iTunes online store and emailed instantly to the birthday boy or girl. Install iTunes: To purchase an iTunes Gift Card make sure you have iTunes on your Mac or PC – If you don’t have it then you can (Download Itunes for Mac and PC here)- Note: YOU MUST HAVE ITUNES INSTALLED TO PURCHASE THE GIFT CERTIFICATE OR CARD ONLINE. Once you’ve installed iTunes on your computer and you log into itunes for the first time you will be prompted to create an Apple ID. This is simply an email address you choose and this together with a password will create an account for you on the Apple Store. When you create an Apple ID you will also be asked for a credit card. Once you have Itunes installed on your PC, and have logged in with your Apple ID you can simply CLICK THIS LINK and you’ll be whisked off to the iTunes store You will be whisked away to the “BUY ITUNES GIFTS” section of the iTunes Store (in the iTunes music player) where you can purchase a card of any denomination up to $50. You will also be asked for the recipients email address. Once you enter all the necessary details and your credit card info, an email will be sent to the recipient that will contain a Certificate Code. Upon receipt of the email, your happy friend simply launches Itunes, clicks the Itunes Store link and then a Redeem link on the right of the main Store page. After entering the code they received in the email they are now credited with however much lolly you gave them. This is another option, you choose the card and it will be mailed (snail mail) directly to the recipient. The recipient will receive the iTunes Gift card inside a paper card that can contain a personalized message written by yourself on checkout. The cards ship within 24 hours and standard shipping is free. (Standard shipping is 3-5 days). Other shipping options exist – 2 day for $10 and next business day for $16. Don’t forget iPhones, iPod Touch and iPads owners LOVE apps! Remember that those little device our Mac pals carry around are pocket gaming devices and everyone loves an app from the iTunes App store (part of iTunes Music Store) See the banner below for the top paid apps. Apps are full blown programs than run on iPads, Iphones and iPod Touches. Popular app categories are games but you can also buy other types of programs such as GPS like software and online radio tuners, sleep monitors, dictionaries, translations software and magazines and book too. <Click to Gift an APP here! Well the Beatles have finally come to iTunes so now you can Buy Beatles Music on iTunes – finally! – another great gift idea for the recipient of a gift card!! Previous Previous post: Winter Tires? Studded vs Non Studded? What’s better?